Currently I am using a really beat pair of plastic Riedell Outlaws with old Heartless wheels (94s?) on them for vert. I skate derby in a pair of Riedell 965s which are an awesome fit. I have overly flexible ankles and an old injury in the left on the outside which may require surgery again (also why I quit competitive derby). 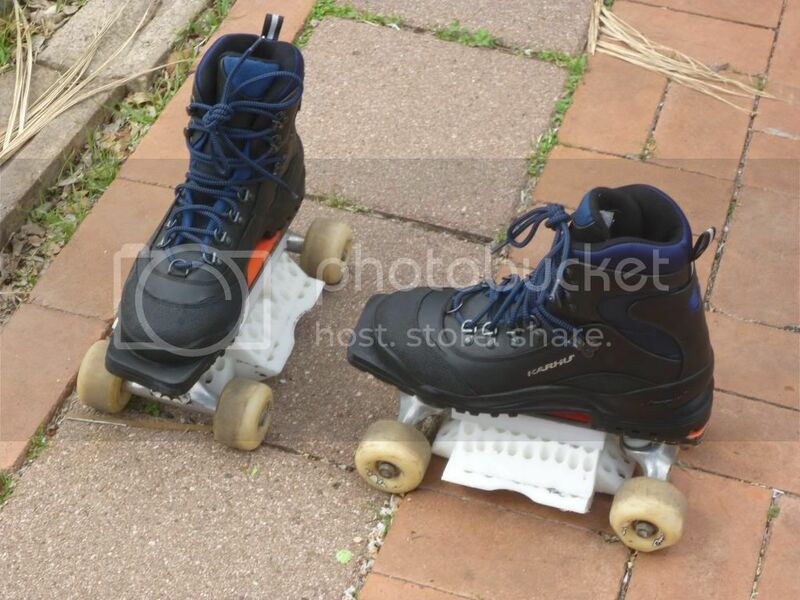 Looking at the different options people are using for vert skates, I see some high tops and some speed style boots. Currently the vert does not hurt my ankle much at all. Will it in the future? Derby did not hurt either, until I developed some power and technique and now the ankle injury is a serious problem. So my question is, should I look at high top hockey style boots for extra support and if so, which brand will fit a narrow female foot? The benefit of the speed/derby style boot is I know what fits me. I believe that the 125 and 126 are on the same last as my 965s, so either of those should work fine. Currently, I skate vert in a low top boot with and ankle brace and it seems fine. I am also not interested in a huge engineering project at this point (although I love looking at what other forum members have built). I found this pre-made grind bar online. http://www.rollergirl.ca/skateshop/r...ars-p-288.html . So I just get the right plates and attach. Also, any opinions on wheels are welcome. What I am seeing from research is harder and smaller is good. Thanks ahead for the advice. I am excited about this project! She's both a derby skater, vert skater and skate business owner. Yes, I will do that. Hoping to get a few other perspectives, but she definitely sounds like the expert. Be clear: I am no expert. I skated vert for the very first time today in my 595s with DA45 plates. Not an ideal set up... but it was fun! Based on what I have seen and my observation from my 1 time on half pipes and in pools and ramps... I would strongly consider a plastic boot like inline skates or a hockey boot. Ordered Antik boots with the XK-4s. I ordered this set up, except with the cheaper Antik boot instead of the 265. More spendy than I had hoped, but hoping it will be worth the investment. If the suede does not hold up to the vert skating, I can change the plates out with my 965s, and skate derby in the Antiks instead. I think I might kinda prefer the Antiks for derby anyway, since the ankle support and foot bed is better. Will post when I receive them and have a chance to skate on them a few times. Have not received them yet, but rollergirl.ca posted a pic on Facebook. Coming on Monday, soooo excited. broken down to photos of all the parts and the finished skates. But, I'll tease you with two photos right now. I hope your new skates from rollergirl work out well. Let us know what you think of them! I'm always interested in different designs. That looks like more skate than I could handle at this point! So far I really like the Rollergirl skates, but I have only been out on them a few times. They are sooooo much better than the plastic Outlaws with the super soft outdoor wheels that I was using before. Will post an update once I have had some time to properly try them out. I am already comfortable going much faster due to the wider trucks I guess. I would advise anyone reading this to look for NOS 651's if you're considering them though as the remakes are garbage - I snapped one at the pivot pin just session skating a few months ago. It's also worth using narrower wheels with the wider track trucks too as wider wheels can increase the likelyhood of tangling them together. As far as snapping pins, I have been using the newer ACE '00' mid track trucks. They bought the patent from the older Independent trucks of the same design. They have been serving me well for at least 3 years, and the pins have not broken, and the axles have not bent. That is high praise from me. I destroy trucks. Though, I have never tried the 651's. 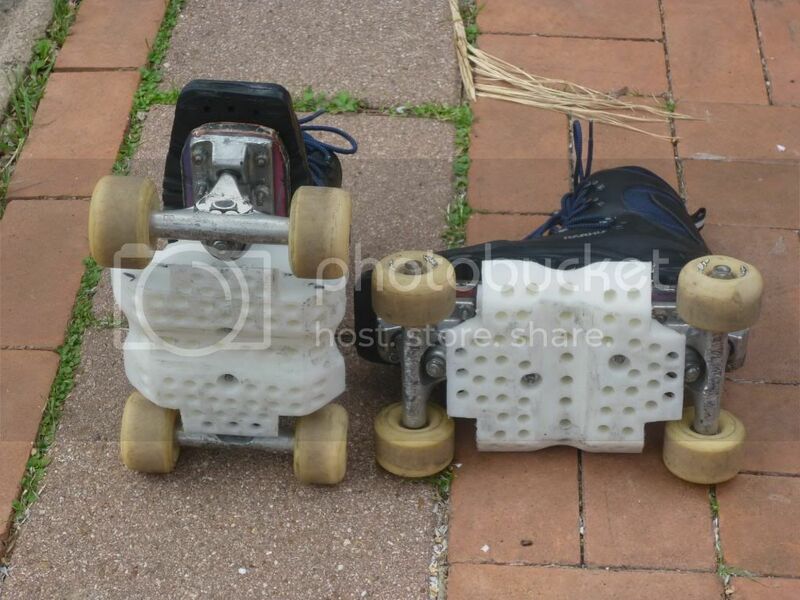 I totally agree with trying to low profile your wheel base to prevent tangling your skates together. But don't make your wheels too skinny, or you will slide out a lot. Trial and error is a good teacher there!